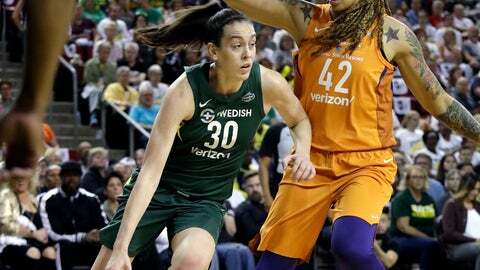 SEATTLE (AP) — After watching her team let a big lead slip away, Sue Bird said hitting the reset button was as easy as resetting the game clock for an extra five minutes. Seattle now has a 2-0 lead in the best-of-5 series, having won Sunday’s first game by an identical score. “Obviously, we’re disappointed to have been in that situation,” Bird said. “You can be upset or what not, but then, we just took a moment and said, ‘All right, we have five minutes – and we actually know how to win.’ This is the playoffs; this isn’t supposed to be easy. During the regular season, the Storm and Mercury were two of the better-shooting teams from 3-point range. Until the fourth quarter on Tuesday, it had been all Settle from downtown, as the Storm was 7 of 16 from downtown, while Phoenix had missed all 14 of its attempts. But Phoenix then drained five in a row – three straight by Taurasi in the final 1:36 of regulation to help force overtime, then one by Bonner and one more by Taurasi in the first 1:39 to help provide an 85-81 lead. The Storm wound up at 7 of 19; the Mercury hit 5 of 19. DeWanna Bonner, who had double-doubled in all three playoff games so far for Phoenix, finished with 21 points and nine rebounds. She didn’t get into double digits until late in the third quarter. … Griner had two blocked shots, tying her with Candace Parker for No. 3 on the all-time WNBA playoff list with 76. … Bird is now above the .500 mark in all-time playoff games. Seattle is 21-20 in postseason play since her 2002 rookie season.